Join GeekChocolate for a trip through the pyramids and turn of the century Paris in the company of intrepid adventurer and journalist Adèle Blanc-Sec, guided by the hand of Luc Besson, director of The Fifth Element. For his first live action directing stint in twelve years, when Milla Jovovich played Joan of Arc in 1999, Luc Besson has returned to what he knows best – capable women in outrageous situations doing pretty well for themselves. This time, rather than the Maid d’Orleans or Leeloo, his muse is Louise Bourgoin as Adèle Blanc-Sec, a character created by French comic book artist Jacques Tardi in the early seventies. Beautifully filmed, as would be expected of Besson, with opening titles rolling like an Egyptian scroll over a middle Eastern flavoured score by long time Besson friend Eric Serra, the action starts in Paris, 1912, a world of dancing girls and museums and galleries, where a book recently published by the eccentric Professor Espérandieu, Is There A Life After Death? has triggered our heroine to travel to the valley of the kings to seek out the mummified body of Patmosis, physician to Ramses II, in the hopes that if the Professor can resurrect the physician, his wisdom and skill will restore Adèle’s sister Agathe, injured five years previously in a tragic tennis incident. In her absence, Espérandieu has also caused a sensation in Paris, with his powers having caused the hatching of a 135 million year old pterodactyl egg, whose occupant now haunts the city, snatching sheep and pets, and terrorising city officials. Yes, this is the world of Tardi as envisioned by Luc Besson, the man who gave us Bruce Willis in an orange vest and a bright blue tentacled opera diva. Just sit back and enjoy the ride. Mademoiselle Bourgoin est magnifique, able to wear a floral bonnet and lace dresses while riding a camel, raiding tombs, flirting with death and taming a pterodactyl, and Nicolas Giraud is endearing as her besotted suitor, Andrej, who proves himself to her by using science to track and lure the pterodactyl that has eluded the authorities. The rest of the cast ably portray a menagerie of policemen, politicians and dastardly thieves, and for supporting roles, Besson has chosen unusual physical types to emphasise the oddness of the film, every one sporting an ostentatious moustache – even Adèle herself, as she employs a variety of outrageous disguises to engineer a prison break. The film is now over a year old, having been release in France in early April 2010, and is only now receiving limited British release, and while it certainly deserves to reach a wider audience than it likely will, it is not Besson’s best work. The plot is slight, and this is the film’s major downfall, and the beautifully lit sets and delightful cast do not make this any more than a diverting whimsical French fantasy, in some places more reminiscent of the films of Jean-Pierre Jeunet than the hard thrillers of Besson, who gave us Subway and Leon. Another frustration is the sloppy translation in the subtitles, frequently substituting local idioms rather than a literal translation. For example, when of Inspecteur Caponi picks up the telephone, his words are translated into the usual English phrase “Caponi speaking,” but what he actually said was the French equivalent, “Caponi j’ecoute,” “Caponi listening.” It should be assumed that anyone with the interest and wit to watch a subtitled film will have sufficient grasp of language to understand a direct translation without having it rendered into native dialect, but that quibble aside, for those content to read while watching their movies, this is an excellent diversion on a wet bank holiday. 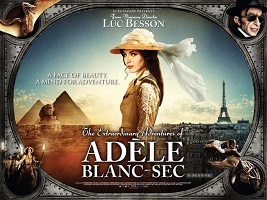 Les Adventures Extraordinaires d’Adèle Blanc-Sec is now on general release.